A pop up that starts with the phrase “Oops, your files have been encrypted!” displayed on your PC screen is a sign of WannaCry ransomware virus infection that is running on the machine. WannaCry virus targets vulnerable Windows systems all around the world aiming to encrypt sensitive data and extort victims for around $300 ransom payment. We strongly suggest you to not pay that sum to the cyber criminals. Instead, remove WannaCry immediately from your system and only then try to recover your encrypted files. 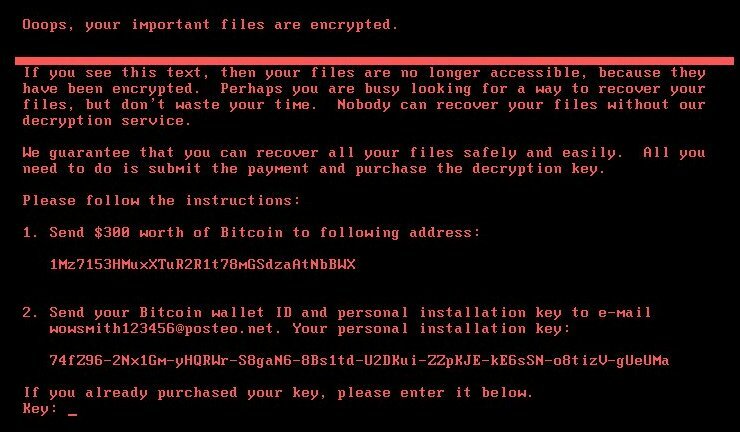 It appears that this new crypto virus is a new strain of Petya ransomware. The attack has so far hit over 12 000 machines in around 65 countries around the world. Don’t pay the ransom because actually, you’re not going to get your files back. Follow our removal guide and remove Petya ransomware completely from the infected host. 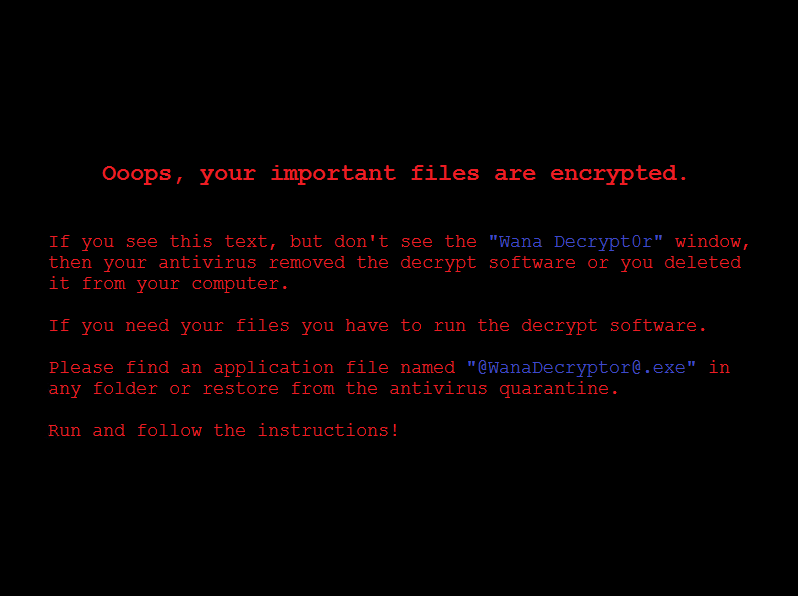 The “Oops, your files have been encrypted!” ransom note is part of malware infection known as WannaCry ransomware. Ransomware is a type of malware that restricts access to computer files and demands online ransom payment in order to remove the restrictions. This specific one is also known under the names WannaCrypt, WanaCrypt0r, Wana Decrypt0r, WCrypt, or WCRY. WannaCry virus removal is essential for the overall PC security. 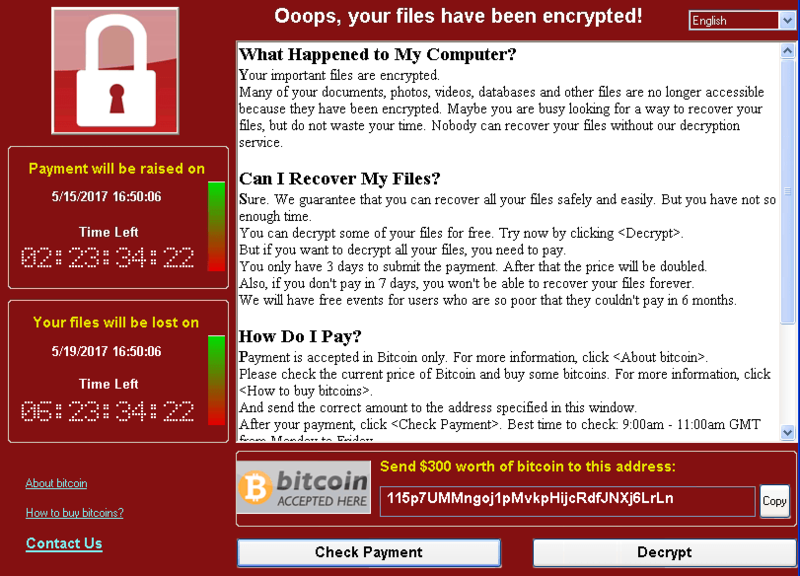 WannaCry ransomware virus also runs an executable displaying the “Oops, your files have been encrypted!” window that contains another ransom message. Hackers indicate victims to pay $300 ransom in Bitcoins to a predefined Bitcoin address in a particular time frame. By deleting shadow volume copies, the ransomware prevents one of the possible data recovery approaches. All mentioned malicious files and objects could be removed by yourself. Below you can find a detailed step-by-step guide how to remove WannaCry ransomware virus and proceed further with data recovery attempts. Have in mind that many victims have paid the ransom that appears to be a not working decision. Hackers probably lost many of the decryption keys and are sending wrong decryption keys that do nothing but steal your money. Usually, hackers leverage social engineering emails as a primary attack vector. They rely on your will to download and execute the malicious WannaCry payload. The crafted emails are likely to contain clickable links in the content or downloadable attachments. A single click on the link may result in an unnoticed download of WannaCry payloads on the computer. The attachments may be presented as commonly files like PDF, TXT, DOC, DOCX, and JPG. However, all these files may contain crafted malware code in them so once they are opened, they automatically install the WannaCry virus payload on the computer. Once the malware infects the system, it starts the data encryption process. 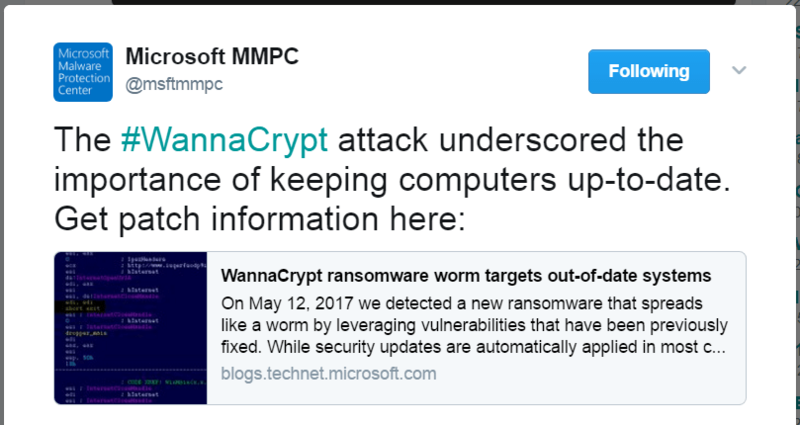 Furthermore, WannaCry has a worm spreading functionality that allows it to attack all vulnerable systems of the same network via SMB exploit. Ransomware handlers used ExternalBlue to exploit a critical vulnerability in Windows SMB protocol. The ExternalBlue exploit is believed to have been developed by the U.S. National Security Agency (NSA). Unfortunately, it was leaked by a hacker group that allows malicious intenders to use it as part of the worldwide WannaCry ransomware attack. The vulnerability exploited by WannaCry ransomware virus was fixed with the release of the MS17-010 security bulletin that is part of Microsoft March patch. An attack of the critical SMB vulnerability CVE-2017-0145 could lead to remote code execution or leak of information stored on the server. Once the dropper Trojan infects a PC with WannaCry virus, it attempts to exploit the SMB CVE-2017-0145 vulnerability in other computers connected to the same network. This attack is expected to evolve over time, so except ExternalBlue other exploits may also be used during the infection flow. WARNING! All files and objects associated with WannaCry ransomware virus should be removed from the infected PC before any data recovery attempts. Otherwise the virus may encrypt restored files. Furthermore, a backup of all encrypted files stored on external media is highly recommendable.